Baked Pineapple and Bacon Jalapeno Poppers | Kitchenpants! Football season is upon us. Football, I have learned over the course of my years, is what we make of it. By “we”, I mean people who don’t really care that much about football – like me. I understand the game, I do. I grew up in Chicago during the reign of Mike Ditka. I can recite the entire Super Bowl Shuffle on cue. I was in love with Otis Wilson as a kid. It just never went any further than that for me: I like football, but our relationship is platonic at best (well, we might be flirting because I do have a fantasy football league AND I am very interested in seeing if the Cowboys are going come out of their 8-8 slump. And then there’s Peyton Manning…swoon). With that said, I am super excited for football season. Football is, like I said, what we make of it and I make this a season of all-day-Sunday-cooking. Yay! 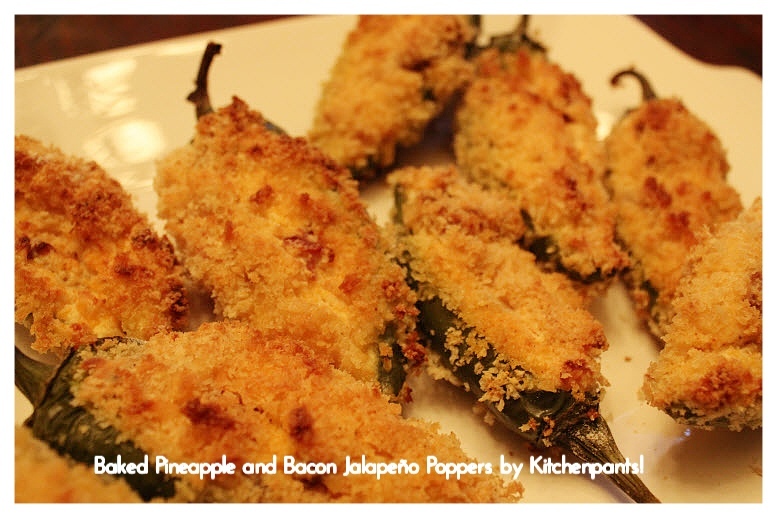 Here’s my first offering to the football gods*: Pineapple and Bacon Jalapeno Poppers. 1 8oz Package of Cream Cheese – I use the reduced fat variety. 2tbs Heavy Whipping Cream – You can use milk if you prefer. Slice the tops off of the jalapenos to make little boats. You can retain the tops for another recipe. Spoon out the seeds completely. You want a hollow pepper. Cook the bacon in your skillet until it is crisp. Remove and drain and cut into bits. Remove the majority of the bacon grease from the pan until there is just the tiniest bit left (dump the pan and let all of the grease drip out – whatever is leftover is what you want). While the bacon is cooking, put the cream cheese, cheddar cheese, cream, and white pepper into the large mixing bowl. You don’t need to soften the cream cheese. Use your mixer to combine the ingredients. 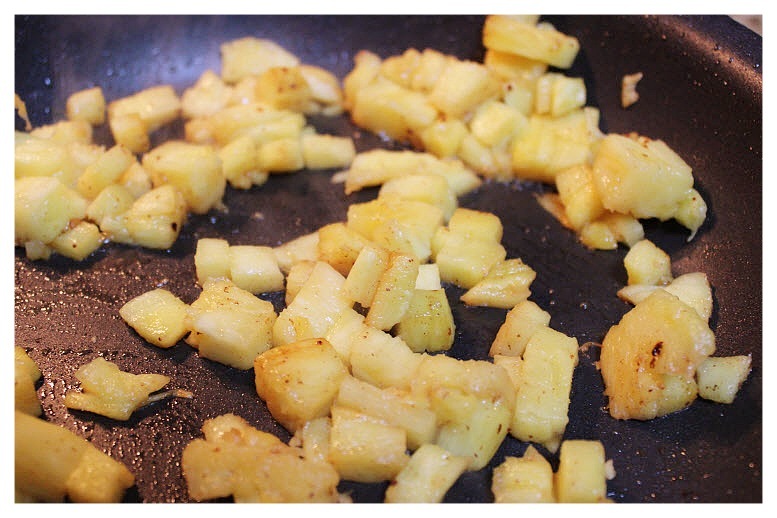 Add the pineapple to the skillet and cook in the leftover bacon juice until just heated through a lightly golden brown. Add the bacon back to the skillet just to combine the pineapple and bacon. Then, add the entire mixture to the large mixing bowl with the cheeses, cream, and pepper. Fold in the bacon and pineapple and set the mixture aside. Prepare your breading stations. Grab three shallow bowls: add flour to bowl #1, beat the eggs and milk into bowl #2, and place the Panko crumbs in bowl #3. If you like, season the flour and Panko crumbs with salt, pepper, white pepper, or whatever you like. 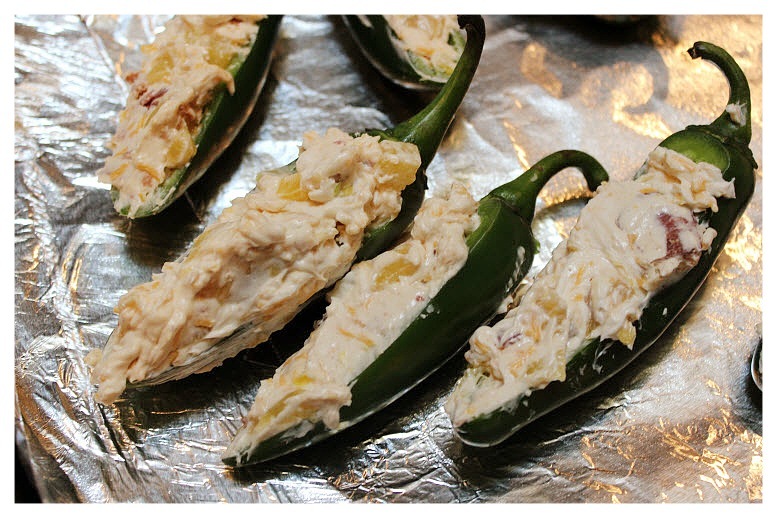 Spoon the cream cheese mixture into each jalapeno. You can overfill them a bit. Bread each pepper by dredging the peppers in the flour, then egg, and then Panko crumbs. Line a baking sheet with foil and spray it with cooking spray (lightly). 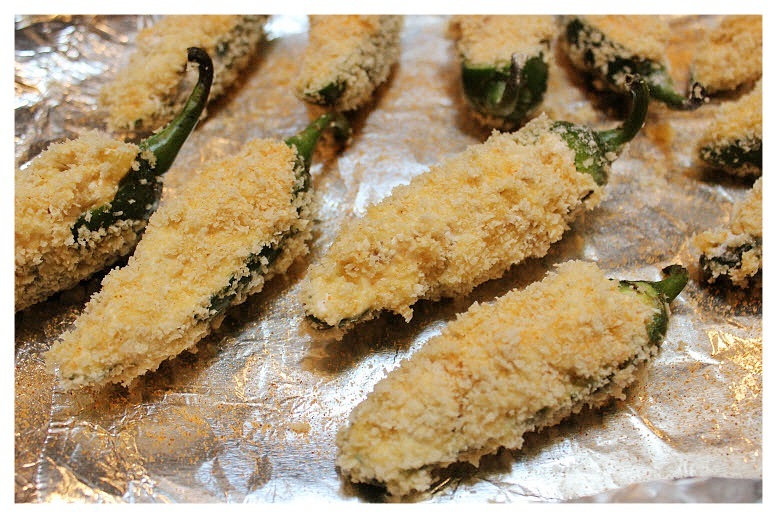 Place each breaded pepper on the sheet with the filling side up. Sprinkle the sheet with Lawry’s seasoned salt. Bake for 30 minutes or until heated through and golden. If you want a very golden crust, melt a little bit of butter and brush it over the top of each pepper. Then place them under the broiler until the tops brown. Enjoy! You can serve these with a dipping sauce if you like, but they honestly don’t need it. *Please let the brothers Manning do well this year (that’s one for me and one for you, JJ!) Also, please let Koby survive yet another Oakland season of defeat and let all of my Wisconsin Carries (yes, I have two! Two Packer Fan Carries!) enjoy their seasons, aye? Give Matt’s Chargers the power to win. And finally, please let Jason Garrett’s motherboard remain intact, and let that Billy Bob Thorton-looking Bears coach survive his year.